The Sweet William is a biennial or perennial that is native to Europe. Flowers often appear in clusters and come in a variety of colors. It is a popular bloom for many romantic and wedding floral bouquets. It is often planted in home flower gardens as an ornamental plant. It also grows in the wild with slightly different color variations. The blooms have a spicy scent that is reminiscent of clove pods. The dianthus barbatus is often a pink blooming perennial flower. The centers are slightly lighter with some having edging colors. There have been many cultivars that produce richer and vibrant blooms. The five petals are serrated and many of the leaves are broader. Deep fuchsia and maroon shades have been cultivated over the years. These often have softer pink centers and markings near the bases. White and near white varieties have also been cultivated for gardens. The white petals may include traces of pink or red in some variants. Others may appear as a nearly pure white, or a creamy white color. The barbatus variety is widely grown in gardens and container boxes. Many grow them at home for a simple and elegant cut flower bouquet. They may also be found in slightly woodsy areas or in a meadow. The second of the major varieties is dianthus barbatus asiaticus. The leaves of this species are more slender than others often are. It is widely cultivated in some areas of the world as a garden plant. Full sun is needed to allow these plants to grow to their fullest. Areas that have partial shade may find that bloom quality diminishes. If no direct sun is available, the brightest location should be used. They also spread quickly, creating a colorful landscape over time. If planted in containers, it may be necessary to thin them out. This may also become necessary in gardens where space is more limited. Loamy soil is idea, often with a slightly alkaline mixture added. Soil should be well drained, and may need additives if it is depleted. If soil does not drain, changes may need to be made before planting. Water requirements are often more generous than some other plants. While regular watering necessary, it does not like over watering. In some areas, there is enough regular rain to fill any water needs. Many plant these to create a fragrant floral garden in their lawn. They may be planted alone in solid color patterns or mixed colors. Others may choose to mix them with other blooms that appear similar. They may also be placed in a container or window box for patios. Window box gardening is ideal for those who are short on space. They may also be used as ornamental cover for sunny patches of lawn. The spicy fragrance of the blooms makes them popular for bouquets. They are often added to bridal flowers to create a rich appearance. They have also been recently used in royal bridal bouquets as well. Florists often use them in bouquets for summer and fall occasions. They often represent gallantry and are used in romantic arrangements. 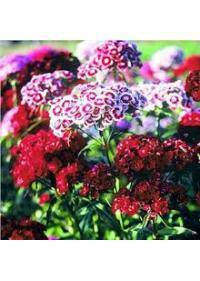 The Sweet William is widely used by florists and home gardeners.